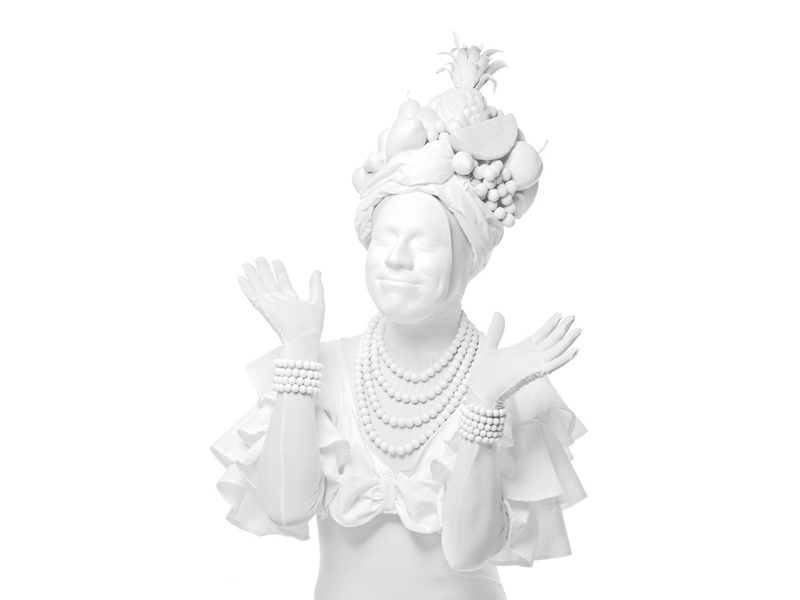 I consider Hollywood actress Carmen Miranda a key figure in the popularization and normalization of the stereotype of the“Latin American identity”, as she personifies our supposedly tropical and perpetually joyous mood. Thus, I see in her exuberant and exotic image the quintessential reduction of a geographical region filled with, yes, rich cultures but also with a very complex diversity of political, social, economic and environmental issues, into a practically empty smiley cliché. This artwork functions as a rather critical comment on the fact that not few contemporary Latin American artists have instrumentalized and taken advantage of this tropical and exotic stereotype as a personal strategy in order to promote and insert their work in the international contemporary art circuit. Parting from this idea, I utilized Carmen Miranda’s iconography in order to create a series of photographs in which I personify her at the same time I critisize the global social construction regarding “the tropical”. With this piece I propose performatic humor as a pivotal element, but also the mise en scène and its photographic registers are devoid of the colorful original conception, also subverting the over-sexualization which also characterizes Miranda’s archetype.